The Historical Society of Rockland County is proud to announce a new collaboration with Hudson River Valley Heritage (HRVH) and Southeastern New York Library Resources Council (SENYLRC), a digital collection of documents, photographs, glass plate negatives, slides, postcards, artwork, and more. This online database now makes a significant part of the HSRC's South of the Mountains local history quarterly accessible to researchers, students, educators, and others who can now view the images from schools, offices, or the comfort of their own homes. 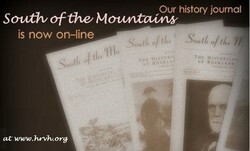 Our digital collection currently comprises issues of the South of the Mountains from 1957 through 1980. For access to these issues, click here. Plans are under way to digitize issues from 1981 through 2010 in 2015-2016. Check back periodically to view new additions. All users of www.hrvh.org have access to other participating institutions' collections.